Usti nad Labem's class 122s are approaching 40 years old but they remain in front line freight service with diagrams that regularly take them to Ceska Trebova and beyond. 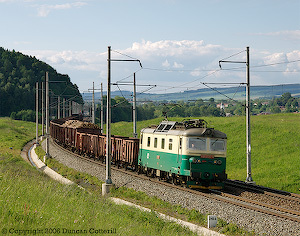 122 046 was approaching Parnik with an eastbound freight when it was photographed on the morning of 11 June 2006. Eighty five class 121 electrics were built in 1960 as a lower geared freight version of class 141. While class 141 are relatively easy to find on station pilot and a few local passenger workings around Praha, the 121s have no booked work and only make rare outings from their Usti nad Labem base. 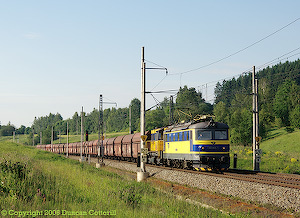 The appearance of 121 019 on an eastbound coal train at Bezpravi on the morning of 10 June 2006 was totally unexpected and a very pleasant surprise. The distinctive blue and yellow locos of open-access operator OKD Doprava can often be seen working coal trains along the Ostrava - Ceska Trebova - Praha main line. OKD Doprava is an offshoot of the OKD mining company based in Ostrava. 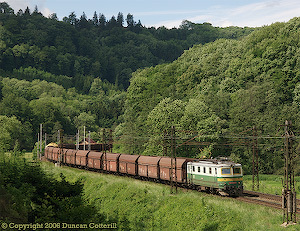 181 040 and 740 458 led a long coal train towards Praha at Parnik on the morning of 09 June 2006. As well as their freight work, Ceska Trebova's class 130s are used on local passenger duties on the Velky Osek - Chocen and Pardubice - Jaromer routes. 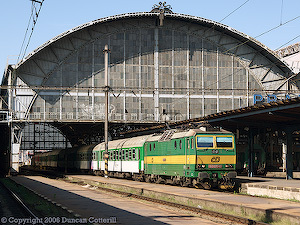 Their only fast passenger duties are on trains R971, R972, R974 and R975 between Ceska Trebova and Hradec Kralove. 130 023 was photographed on R974 passing Parnik under a dramatic sky on the afternoon of 07 June 2006. Class 150s are infrequent visitors to Ceska Trebova these days. The class spends most of it's time working fast trains on the secondary main line from Praha to Hradec Kralove, duties that hardly exploit the locos' 140 km/h capabilities or their 4000 kW power output. 150 023 made a surprise appearance on IC588, the 16:28 Bohumin - Praha hl.n. express, on 07 June 2006. 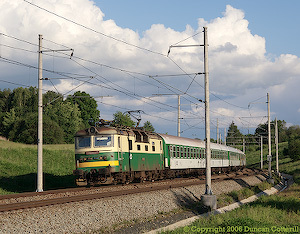 The train was photographed at Parnik on the northern outskirts of Ceska Trebova. ZSSK's 350 011 has recently been repainted in this attractive red and white livery to match Slovakian InterCity passenger stock. 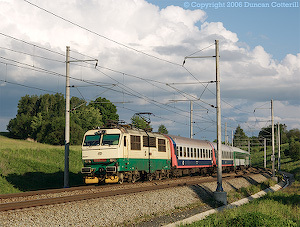 It also looks very good when paired with blue Hungarian coaches as evidenced by this photo of the loco working EC170 from Budapest to Berlin at Parnik on the afternoon of 10 June 2006. After their well publicised problems in January, CD's pendolino units appear to be operating reliably now. 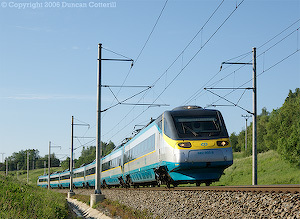 680 003 was photographed leaning into the curve as it accelerated away from Parnik with SC502, the 05:45 Ostrava to Praha SuperCity service on 11 June 2006. Although the pendolinos are booked to cover the 358 km in 40 minutes less than loco hauled InterCity services, little of the difference appears to be due to the tilt as the line is fairly straight most of the way. 680 001 was doing test runs in the Ceska Trebova area during my visit. 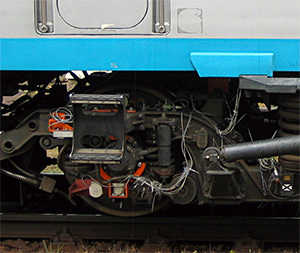 The photo shows some of the cabling connecting sensors on the bogie of 682 001 to test equipment in the coach. One of the crew indicated that the tests were in preparation for the pendos running through to Wien from some time in July. 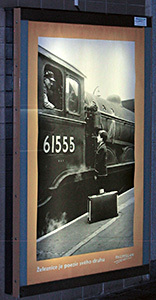 This poster at Praha Holesovice shows an LNER B12. A strange choice for a country that produced so many outstanding steam locos of its own. Ceska Trebova's class 163s share fast train duties on the Hradec Kralove - Praha line with Praha's class 150s. 163 073, seen earlier on Ceska Trebova - Pardubice locals, hit the big city with R748, the 13:06 fast train from Mezimesti, on 11 June 2006. Czech Railways have a big problem with graffiti on coaches but don't seem averse to defacing their own locos when it suits them. This garish red and yellow abomination was once the handsome 151 014 and is now an advert for post office savings. This report covers a short trip to Ceska Trebova from 07 to 11 June 2006. My recent trips there have all suffered from poor weather and two have been notable for not producing a single decent photograph. Fortunately this time was different and there were some good sunny breaks as well as long cloudy periods. Ceska Trebova is one of the Czech Republic's major rail centres, located at the junction of the electrified main lines from Praha (Prague) to the major cities of Brno and Ostrava. It has marshalling yards, a large shed, a locomotive works and plenty of passenger and freight trains worked by a wide variety of electric locomotives. The most scenic sections of the Praha - Ostrava main line lie either side of Ceska Trebova, making it a natural target for the photographer. As usual, I flew from Heathrow to Praha with CSA and travelled round by train using a first class Sitove Jizdenka (network ticket). My base for the trip was the excellent Hotel Korado in the centre of Ceska Trebova and less than 10 minutes walk from the station. The vast majority of trains ran with the booked traction and there weren't any major surprises. See the sightings page for full details. Most EuroCity trains on the Praha - Brno - Breclav route were powered by Slovak class 350s but EC75 and EC70 were regularly hauled by CD class 362s. These two trains (and EC71 and EC74) were booked to be worked by pendolinos from the start of the 2005/6 timetable but have not gone over yet. There are indications that the changeover may occur in July. EC134, EC135, IC570 and IC571 on the same route were all pendolinos as booked. EuroCity and InterCity trains on the Praha - Ostrava route were worked by class 151s except for a couple of isolated occasions when a class 150 or 162 substituted. Pendolino units worked all the SC trains as expected. Fast (R) trains on the Ostrava route were 162 worked with 362s hauling through Praha - Brno fasts. Other fast trains on the Brno line were 363 hauled. Class 130 continued to work trains R971, R972, R974, R975 between Ceska Trebova and Hradec Kralove but R970 and R973 ran through to HK with class 363s. Local passengers on the Pardubice and Prerov lines were 163 hauled with 363s handling similar workings on the Brno line. Train 5043 from Usti nad Orlici to Svitavy and 4776 back to Ceska Trebova were notable for being 130 hauled. Unfortunately the other short workings to Svitavy were booked for 810s as were all trains on the minor line to Chornice. 130 011 / 017 / 019 / 020 / 023 / 030. 151 001 / 004 / 006 / 011 /012 / 014 / 018 / 020 / 027. 163 071 / 073 / 074 / 081. 350 001 / 003 / 004 / 006 / 011 / 012 / 013 / 015 / 016 / 020. 362 112 / 118 / 120 / 121 / 122 / 166 / 167. 363 030 / 159 / 161 / 163 / 170. 680 001 / 003 / 004 / 005 / 006 / 007. Class 163s worked most freights on the Prerov line and about half of those towards Pardubice. The majority of these were Ostrava based locos. On the Pardubice line most of the remaining freights were hauled by class 130s with a handful of locos of classes 122 and 123 also appearing. The class 181 and 182 locos that worked the majority of east-west services until a few years ago were still in evidence but only two were seen over a period of four days. The undoubted highlight was the appearance of 121 019 on a freight from the west on Saturday morning, the first of this class that I've actually managed to photograph. Open-access operators' workings were less frequent than expected and only two trains were seen during my stay. On Thursday a pair of Unipetrol 740s worked east past Bezpravi with a long train of oil tanks at 13:15 and on Friday OKD Doprava 181 040 and 740 458 headed west from Ceska Trebova at 07:30 with a coal train. 122 022 / 031 / 046. 130 028 / 030 / 031 / 033 / 035 / 037 / 039 / 042. 163 023 / 025 / 027 / 032 / 033 / 038 / 044 / 245 / 251. 740 458 (OKD-D), 740 719 / 879 (both Unipetrol). Traffic was generally heavy with no less than 96 trains seen in a 12 hour session by the lineside on Thursday. That's proper trains and doesn't include the numerous light engine movements or occasional empty class 810 railbus. Workings weren't evenly spaced. There were long quiet interludes when absolutely nothing happened and short periods of frantic activity when there was barely time to note the details of one train before the next appeared. At least the times of the passenger trains could be predicted from the timetable. Most of the passenger action was between 45 minutes past one hour and 15 minutes past the next with very few trains scheduled for the remaining 30 minutes of every hour. The freights didn't seem to run to any regular pattern and were as likely to turn up during the busy half of each hour as during the quiet 30 minutes. There did seem to be times of the day when freights were more likely to turn up. For instance there were never any eastbound freights between 15:45 and 17:15 and there were always at least 2 and on one occasion as many as 5 eastbounds between 17:15 and 18:50. Similarly, there were no westbounds between 07:30 and 10:00 except on Saturday there were two trains during that period. Freight traffic was as varied as it was erratic. There were plenty of coal trains and mixed freights as well as the odd block trains of oil tanks, vans, containers, cement or cars. The weather was very changeable during my visit and could go from completely overcast to predominantly clear and back again in less than an hour. The mornings tended to be clearest but there was also some good light every afternoon or evening. The middle of the day tended to be almost totally overcast, not that it mattered as the sun was too high for successful photography from 11:00 to 15:00 and difficult for an hour either side of that period. Although it was cloudy much of the time, there were more than enough trains during the clear spells to produce a satisfying number of well lit shots. Most time was spent around Parnik, about 3 km west of Ceska Trebova on the line to Pardubice, where the line curves through a deep cutting before crossing the valley on a modern viaduct. This section is basically north-south and ideal for mid summer photography. The hard winter seems to have held back vegetation growth as several shots that required extensive clearing in summer 2004 were easy to get this time. I also visited a superb location near Bezpravi, between Usti nad Orlici and Chocen. This spot is in the shadow of a steep wooded hillside for much of the year but is clear by mid morning in June. Tatenice, on the line to Prerov, was also investigated. The station here is located between two tunnels but the best shots are shortly after midday and better suited to spring or autumn lighting than mid summer. Passing Usti, 111 032 was noted on Os15064 on Thursday and 130 017 was on Os15061 on Saturday. 749 011 and 749 019 were seen at Usti with a freight from Miedzylesie on Wednesday. There were several Austrian class 1116 around the station and yard area on Sunday so the direct route to Wien is obviously open again. Os9208 from Svetla nad Sazavou to Praha had 123 013 on 11 June. This train is loco hauled on summer Sundays only. The Sitove Jizdenka was getting frustrated sitting in my pocket most of the time and only seeing occasional use on second class local trains. As a treat, I decided to take it for a spin on Sunday on the way back to Praha. 362 112 took me down to Breclav on EC75, covering the curvaceous 91 km to Brno in 58 minutes and arriving 3 minutes ahead of schedule. The return from Breclav was on IC570, one of two services on the route booked for class 680 pendolino units. Although it was a Sunday afternoon, when the entire population of the Czech Republic seems to travel towards Praha, there were no other passengers in the rear first class coach all the way to Pardubice. The interior was quite claustraphobic with closely spaced high backed seats and small windows contributing to the effect. Riding wasn't exactly smooth and the transitions between level flight and tilt were a bit on the lumpy side. I was particularly keen to see how the 680 would perform on the sinuous section north from Brno where speed is limited by repeated tight curves. According to the working timetable, IC570 is allowed 54 minutes from Brno to Ceska Trebova (start to pass) compared with 61 minutes (start to stop) for a 350 hauled EC service. We did it in 53 minutes in spite of losing an estimated 2 minutes due to a signal check at Opatov. From Ceska Trebova to Pardubice took a mere 29 minutes instead of the booked 32 minutes and the 20.7 km from Chocen to Moravany were covered at an average of 160 km/h. Although the speed was impressive, you do have to wonder whether it was worth the additional cost and hassle for the time saved. The 680 has a definite advantage over the curves between Brno and Svitavy and from Ceska Trebova to Chocen but the rest of the route is pretty straight, so the net gain over a much heavier loco hauled EuroCity train due to the tilt is only about 8 minutes and that doesn't take into account the time saved by running through Ceska Trebova instead of stopping then accelerating away again. On the straight section between Chocen and Pardubice the 680 and the EC are both allowed 15 minutes so the 680 has no significant advantage in spite of having a considerably higher power to weight ratio. Most pendolino services operate over the Praha - Ostrava route which has much less curvature than the Brno line and the tilt advantage there can't be more than 5 minutes overall. Most of the pendolino's time gain on this line appears to be due to not stopping at so many stations and better acceleration away from speed restrictions. You do have to wonder whether the €152 million invested in the seven pendolino units wouldn't have been better spent converting the rest of class 150 to 160 km/h 151s, regearing some 362s or 363s for 160 km/h operation and buying some new coaches. This would have achieved most of the service speed up at a fraction of the cost. The Czech police seem to think it's all a bit fishy as well and are investigating the pendolino purchase. It certainly seems to be a criminal waste of money. Ceska Trebova is an excellent centre for those wishing to see Czech electric locos in action. Most of the DC and dual-system classes are regular visitors and, with an average of around 4 trains an hour in each direction on the line to Pardubice, there is enough action to keep most people happy. Photographically, the area has plenty to offer with some very pleasant locations on the outskirts of Ceska Trebova itself and more dramatic scenery in the Orlice valley between Usti nad Orlici and Chocen. There are also possibilities on the lines to the east and south. All in all, it was a very good trip, particularly as I'd been trying to get some of these shots for several years without success.